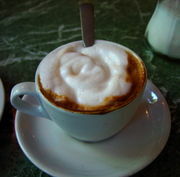 Cappuccino is a large Italian beverage prepared with espresso and foamy steamed milk. A cappuccino differs from a cafe latte, which is mostly milk and little foam. Besides a quality shot of espresso, the most important element in preparing a cappuccino is the texture and temperature of the milk. When a barista steams the milk for a cappuccino, he or she creates microfoam by introducing very tiny bubbles of air into the milk, giving the milk a velvety texture and sweetness. In some places, skilled baristas create latte art when pouring properly steamed milk into the espresso, making designs such as apples, hearts, leaves, rosettes, and corporate logos.